After the success of the first 515 Axles on Toyota TD25 Tow Tractors & at the request of several customers requiring upgrades for the Toyota TD23 Tow Tractors the Axle design has now been changed. With the change in mounting configuration the Axle is now suitable for use on both Toyota TD23 & Toyota TD25 Tow Tractors. For more information on the NEWAGE 515, click here. 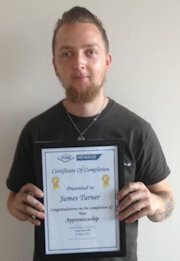 Well done to James Turner who has after four years of very hard work today completed his apprenticeship. James will now move on to the Drive Axle Assembly area. Bradshaw Electric Vehicles based in Peterborough, UK, take their first production 116 Electric Drive Axles. Sage Parts our North American distributor receives the first production 515 Axles. The 515 Axle is a direct replacement for use on the Toyota TD25 Tow Tractor. Contact www.sageparts.com for further information. 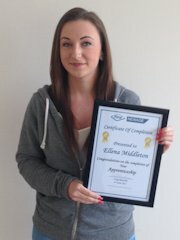 Well done to Ellena Middleton who has after four years of very hard work today completed her apprenticeship. Ellena will now move in to the Technical Department. Jungheinrich based in Luneburg, Germany, take their first production 116 Electric Drive Axles. NMC-Wollard based in Eau Claire , WI, USA take their first production 612 Axles for production in their M100 / M140 Tow Tractor range. Trowin Industries based in Eau Claire, WI, take their first production 612 Axle for production in their GSE range. Sage Parts our North American distributor receives the first production 613 Axles. The 613 Axle is a direct replacement for the OMSI Axle used within the TUG Range. Contact www.sageparts.com for further information. NMC-Wollard based in Eau Claire, WI, take their first production 512 Axles for production in their M60 Tow Tractor range. 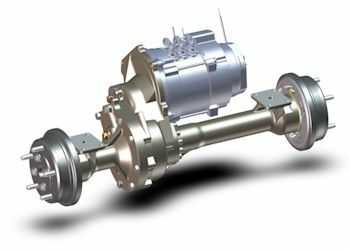 Fenwick based in Dissay, France, take their first production 116 Electric Drive Axles. We are exhibiting our range of dedicated baggage tow tractor axles. Our 412, 512 and 612 tow tractor axles are available in many different track widths, with both braking and mounting options. This range has maximum load ratings from 7,000 lbs thru to 22,000 lbs. You can find us on Stand 307 at the Rio All Suite Hotel and Convention Centre in Las Vegas. The show runs from the 14th to the 16th October. More information can be found here. Charlatte USA based in Bluefield, VA, take their new 215 disc brake axle for use in their GSE belt loader applications. 'PRM Marine Ltd' have now officially changed it's company name to 'PRM Newage Ltd'. The brand name 'PRM' has been recognised by the marine industry for decades and is firmly associated with the marine gearbox products we manufacture. Tug Technologies Corporation based in Kennesaw, GA, take their first 613 Axles for Testing in their MT / MR Tow Tractor range. PRM have recently created a LinkedIn page. LinkedIn is a great marketing tool, and allows us to regularly update our customers with announcements regarding new products, service announcements and details of which shows we will be exhibiting. To gain access to these regular updates, please follow us using the button below. As of this week, the NEWAGE 512 axle has now been exported to Asia for the first time. This means that the NEWAGE 512 has been shipped to two different Continents outside of Europe since sales began in Q4 of 2013. 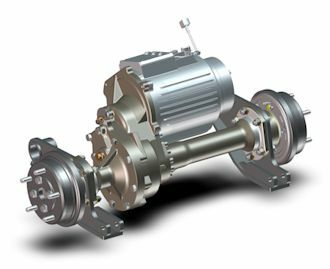 Asia joins the Americas as the two destinations of the Tow Tractor axle, with more continents expected to follow soon. For more information on the NEWAGE 512, click here.